Located on the second floor in the stylish new Saks Fifth Avenue in The Galleria, 51fifteen offers globally inspired, locally minded cuisine created by Executive Chef Lulzim “Luigi” Shimaj. This restaurant features an artfully designed modern dining room, bar, semi-private lounge and private dining space, along with Bar 12, a satellite café and bar located in the center of the first floor of Saks Fifth Avenue. Complementing the stunning new space is an innovative, chef-driven menu focused on locally sourced, seasonal ingredients. With nearly 25 years of experience in the culinary industry, Rafael Villanueva began his career as a server before taking on management positions. Working his way up in the industry has given him a unique perspective about what makes customers’ dining experiences not only great, but memorable. As a self-proclaimed “behind the scenes” person, Rafael is married to providing superior customer service, going out of his way to make guests happy and delivering the most special dining experience possible. 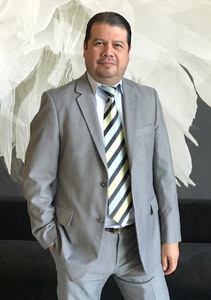 Rafael’s passion for the industry has been ever-present and contagious throughout his past nine years working for Landmark, earning him the title of General Manager at 51fifteen. He’s proud of all that the venue offers – from the delicious cuisine, to the fine dining experience, to the dedicated staff – and looks forward to taking the restaurant to the next level. Monday – Wednesday: 11 a.m. – 9 p.m. Happy Hour: 3 p.m. – 7 p.m.
Saturday & Sunday: 11 a.m. – 3 p.m.
Saturday: 3 p.m. – 10 p.m.